The Wilmington, N.C. waterfront property at 311 Bradley Creek Point Road is listed for sale by the real estate agents at Hardee Hunt and Williams. This stunning majestic estate has lush, green grounds, beautiful gardens, a private dock, open air patio, built-in custom cabinetry, and other details ideal for luxury waterfront living. Wilmington, N.C., September, 2011 -- 311 Bradley Creek Point Road in Wilmington, N.C. is a waterfront property close to Wrightsville Beach and designed for luxury living. The home is listed by Hardee Hunt and Williams, a boutique real estate company that specializes in waterfront homes in and around Wrightsville Beach, N.C. The home and estate at 311 Bradley Creek Point Road offers the height of luxury living in the Wilmington area. Well designed and masterfully crafted details adorn the property inside and out to showcase the beauty of living on the water in Wilmington. 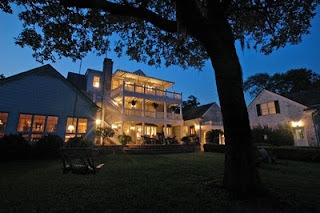 Located in the quiet and private Airlie Community with nearly one full acre of Intracoastal waterfront, lush manicured grounds, and established old growth live oak trees, 311 Bradley Creek Point Road is a five bedroom, five full bath and two half bath estate with detached garage and guest room overlooking the marshes and waterway with unobstructed views. Ample outdoor living space as well as great windows allows homeowners and guests the chance to truly bask in the beauty of this estate. Details of the property include: Multiple private boatslips including boat lift for fishing, sailing, and all season water enjoyment; exterior brick patio that opens via french doors to a waterfront sun room and additional waterfront family room; executive chef's kitchen complete with granite counters, dual ovens, subzero fridge, walk-in cooler, wine cellar, gas range, wok stove, and indoor grille with stainless steele backsplash & commercial grade hood system; formal dinning room as well as casual breakfast nook; top level waterfront master suite with vaulted ceiling, wide plank wood flooring, oversized closet space and luxury bath; and private upper level waterfront deck; propane fueled high-end generator. Hardee Hunt and Williams is a Wrightsville Beach real estate company with a focus on Wilmington area waterfront and beachfront properties as well as Landfall and Figure Eight Island real estate. The agents at Hardee Hunt and Williams are dedicated, knowledgeable, well connected among the local community, and able to provide the service and results each client deserves. They are excited about the opportunity to list 311 Bradley Creek Point Road on behalf of their client. For more information about this property, visit http://www.311bradleycreekpoint.com. To learn more about Wrightsville Beach real estate, contact Hardee Hunt and Williams at http://www.HardeeHuntandWilliams.com or 910-256-6998. Are You Ready To Live On Wrightsville Beach?